Hello, pardon the lack of formatting for this post, I'll be trying to update this over time as I am new here. I've been wanting to do something in California for a while now, but had little means or motivation to until now. I was given an awesome 4k×8k heightmap of California (attribution soon! wanted to post this before forgot to) and have been working on this off-and-on for a while. 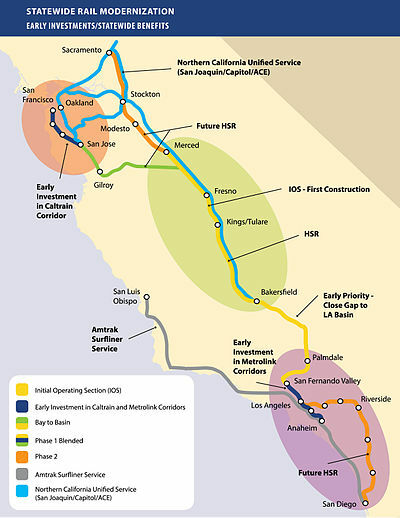 My goal is to recreate a decent rail system in California, including Amtrak, CalTrain, BART, MetroLink, California HSR, and perhaps light rail stuff too. I'm still deciding stuff about which newGRFs to include, but yeah. Edit 1 (2-1-2018): Just made the attached pictures smaller. Also, considering using FIRS3 for the map once it's done. Also, quick question for anyone interested: pondering making the interstates elevated...and two one-way streets. Perhaps it should be elevated but one two-way? File comment: Zoomed-out view of progress on the Bay Area. Most city cores are placed. File comment: Zoomed-out view of progress for the LA Basin area. Again, most city-cores are placed. Last edited by amtraklinuxrussian on Tue Jan 02, 2018 9:58 pm, edited 1 time in total. Looking good ,quite a load of choice of grfs you could use here ,I'm tempted to fire up Firs , a dash of America grfs a splash of Auz and a sprinkling of NARS .My preference would be to load up jgrpp 0.22.1 , make good use of the patches .Definitely big bad boy steamers ,I love American Steamers , trams for the towns , for the mines we need heavy trucks . Hope this helps , look forward to future developments . In Los Angeles county, and most of the other densely populated counties, the freeways are elevated with at least 4 lanes in each direction while the major streets are generally 2-3 lanes in each direction. As I remember, this is also the case in the Bay Area. On the other hand, most of Interstate 5 runs through the central valley and it is flat (at-grade?) and 2 lanes in each direction which widen to 4 or more lanes each way as they hit the big cities. So, maybe elevated and 2 tiles in cities with level 1 tile 2 ways for the long rural stretch. Not sure how I'm going to be "updating" this thread, but yeah just going to post some stuff as I'm not really keeping as good track as I probably should, haha. Well, I've made some progress in my scenario. Namely just placing more cities and a few landmarks. Added are a few towns in Owen's Valley, places directly south of San Bernadino, more cities in the San Francisco Peninsula, and placing a few more lakes around the place. I also dabbled in adding in infrastructure for Highway 99 and Interstate 5; however, this is only in the Grapevine area (and single-tile...may change that). I've also been re-placing (not replacing) cities in order to use the North American building set I've added since my first post, allowing more "suburban" or lower-height buildings. Some things I've been mulling over: I've seen some eye-candy (such as central medians, overhanging signs, etc) from the Dutch Road Furniture newgrf, and been thinking that those could/should be used for at least Interstate 5, though I'm still not sure. It would require a lot of demolition, but if it turns out well enough it may be worth it. A downside to this is it would basically widen the highway from 2-tiles to 3 or 5, depending on if the signs are used to span the entire roadway. If you have thoughts feel free to share (just know that this may change over time). Sorry for the hiatus, but sometimes just not in the right mind for this...slow and monotonous work of placing cities. The toughest city to place thus far has been Sacramento, mainly due to not many surrounding landmarks or other cities to really base it off of. I finally placed it though. But yeah, progress *will* be slow sorry about that. File comment: Sacramento is finally placed! I used some rough estimates with Lake Berryessa to place it and some other features. Not sure how I'll place the river yet. File comment: I've finally placed some trees in this map! Also here's a view of the buildings used, using SF as the baseline. File comment: Just a review of the SF Bay Area. Placed most cities that I'll have here. Hi all! Yet another hiatus. Been helping out around the house while also getting stuff together while also job searching...*sigh* things have been hectic. However, most of that is done and I've started editing the map again! Some (small) progress has been made: Have in a few more reservoirs (Shasta Lake, Lake Isabelle, and a couple others), and I've finally started placing tiles for the Sacramento and San Joaquin rivers! I think I'll probably only place both at very rough placement throughout the Valley, since I'm not that great at making rivers, haha. I've got Sacramento placed pretty well, and will be placing the rest of that metropolitan area next. I think, then, things will be ready for a "roadless" release the map is 8k×4k, so it's not really that "easy" on any system, just a forewarning. I have ideas for NewGRFs. - NA CitySet is a good building set for this. - American Road Replacement Set is great for roads. - Lightrail/Tramtracks is good for the light rail lines. - NARS and NARVS are good vehicle sets to include. You should also include NekoMaster's NARS addon. - Though they are more european, Bob's British Buses, Bob's British Random Vehicles and Bob and Ameecher's Tram Set fit good, especially since there are all kind of trams, even diesel and steam ones in BATS. - 2cc Rapid Transit For Me gives a great set of 3rd rail trains that can also be used as commuter trains. To use these trains, you need Metro Track Set. If you rather don't like the original tracks, use Finescale. North American Track Set doesn't provide 3rd Rail AFAIK. - 1000 Building Set fits good for all those buildings in cities. Awesome NewGRF suggestions! I actually have just about all of those already included Before publishing anything I'll go through to make sure that the newgrf dependencies aren't too bad (I have marico in it, but could always take it out). Interesting. You can also consider California City Set. I am sorry that I did not make more buildings. But if somebody is motivated to give it a try then I am more than motivated to help and teach. AFAIK buildings are codable in NML. I would give it a try if you're okay with restarting from scratch in NML. These actually are coded in NML. You can download sources in the development thread. These also include GIMP files. You can modify it. You just have to follow the GPL licence requirements. If you are just going to tweak existing set then it would nice to keep development still under the same thread. What I also wanted to do is a set of individual houses. There are huge areas in California that are covered by them. Perhaps about 10-20 different styles with small variations is sufficient. My vision was to have separates sets for different house sizes. Does not have to be like this but kind of made sense to me. Do you have non-coded sprites ? Each grf is accompanied with a zip file that contains nml code, compailer instructions, converted png files (i.e. sprites) and graphics sources as gimp (a PS like graphic editor, just in case it does not click) files. Ah, I had been looking at the California City Set, but for some reason the buildings just won't spawn for me :/ so yeah. I have mostly finished the Sacramento Metro Area, and it looks sparse because I'm leaving room for the cities to grow into one another. I've been playing around with the idea of making two versions of the scenario: one with the cities grown quite a bit and the other with it as-is, but I probably won't do that. I've also added in several reservoirs and smaller towns. I won't add any more smaller towns in the hills since those can be quite numerous, and I'm already slow with this project anyway, so probably better to release with the "main" towns so to speak. Good news!!! The first release is live! Verion 0.1, and it is built for JGR Patch Pack >= 0.25.2 If there are any problems, please let me know and I'll get to fixing them asap! I apologise for taking so long for this, I've been job hunting and dealing with a new dog and other personal life stuff. I hope this scenario is fun for some people at least! No intercity roads exist (minus a test road I did in Stockton for Interstate 5), nor do industries. Trees were taken out for this release so that I could upload it. I also ran into problems when uploading this scenario with trees, as that would produce a > 30MB scenario, opposed to the ~7-10MB one right now. If anyone has any advice for this, please let me know! Congrats on getting California up and running , You have made a big error on your Industry , not a bug on FIRS , you have 3 Industry sets , you should only have 1 , remove Town and Industry and it will be fixed . On the choice of Industry great choice on FIRS , However my personal choice of Economy would have been " In a Hot Country " . On the city sets , I would have included the California City Set ....viewtopic.php?t=76786 . Fake Airport objects ,ISR GRF, AUZ Objects/Station sets , great candy ,HEQS 1.52 FOR Hauling from the mines , a ship set , nice rivers could use a paddle steamer , a log barge hauling wood from the forest .Just a few suggestions from my own preferences for a game . Keep up the good work , look forward to the next update . Had a play around with GRF's and Firs , building sets not sure .